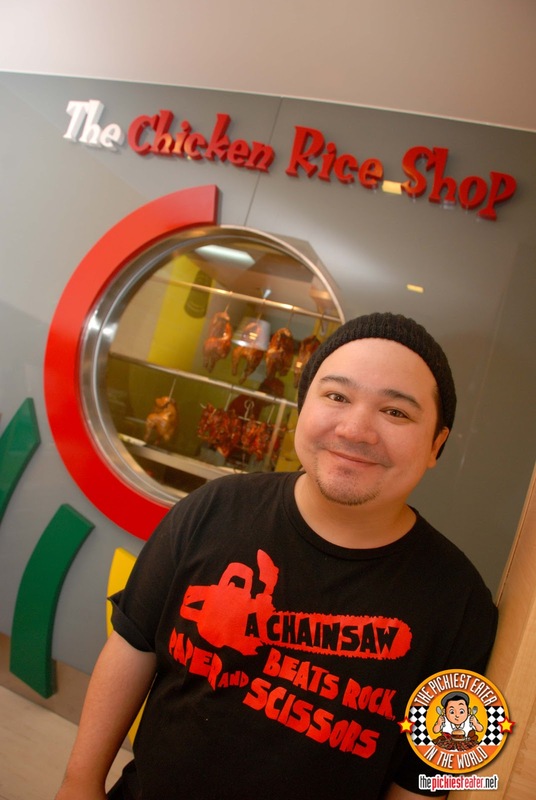 THE PICKIEST EATER IN THE WORLD: CHICKEN OVERLOAD: THE CHICKEN RICE SHOP! 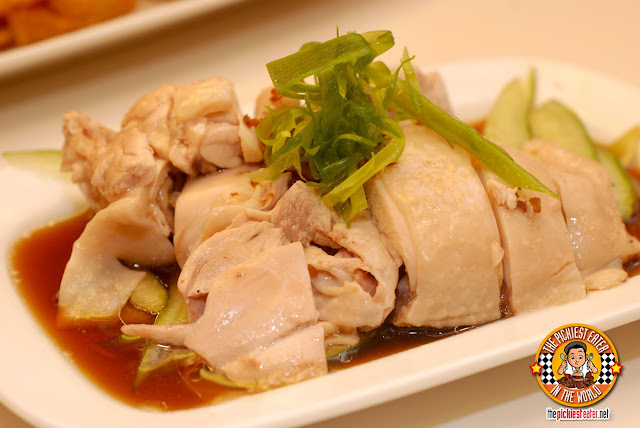 What's your stand on Hainanese Chicken? With its subdued flavors and bland appearance, a few of my friends see it as nothing more than a glorified piece of boiled chicken. Me? Surprisingly, I actually really like it. Perhaps it's because the chicken, when you get the right part seems fatty enough for my standards. Maybe it's the ginger sauce that I love mixing it with. Or it could be the chicken rice itself.. because when it's done right, one cup is never enough. One Sunday morning, I was pondering on where to eat for "Brunch" before we headed off to my parent's place for the actual "Lunch". Since my mom does the cooking and no one has the guts to complain, we usually eat around 1pm or even later, so I thought having a light brunch at around 11am would be a wise move. I remembered passing by the recently opened restaurant, "The Chicken Rice Shop" during our trip to Sandwicheese the week earlier, so I thought of giving that a try. And just like that, any thoughts of a "light brunch" was thrown out the window. The Chicken Rice Shop is actually a franchise from Malaysia, brought to our shores by the Pancake House group. We went to their Katipunan branch, which is one of their two branches that they have here in the country, with the other one located at Robinson's Place, Manila. There is parking in the front, a few behind the building, but do remember that this is Katipunan, so it isn't always readily available. 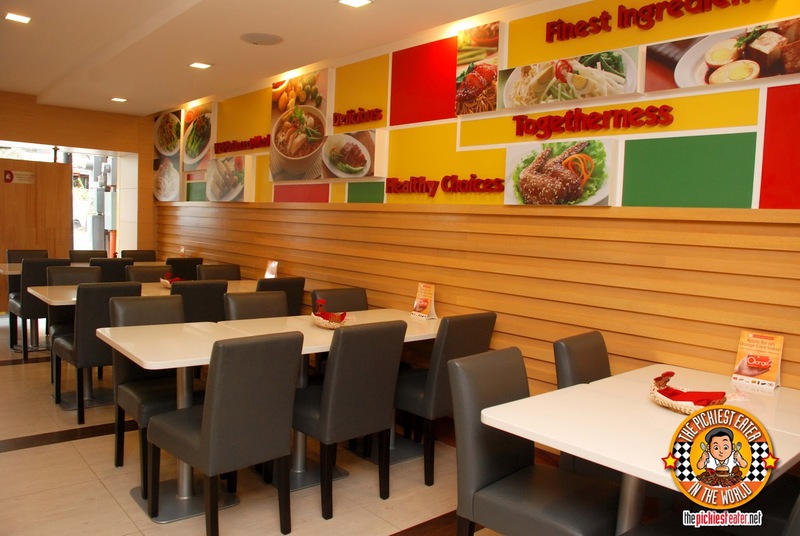 As reflected in their logo, the place has vibrant colors all around, decorated with pictures of dishes and blurbs reminding people that their Hainanese Chicken is the healthier alternative when compared to other deep fried chicken dishes out there. Maybe it was the pictures on the walls, but the place kind of reminded me of Icebergs. I've got to take time to commend a member of their staff named "Louie". Though he looks quite young, he's obviously one of the more seasoned waiters of their young group. But he was alert, polite and very attentive. I had mistakenly forgotten to mention that I wanted all my chicken dishes to be thigh part (I'm so ashamed of myself for forgetting to mention that..*face palm*). He went back into the kitchen and when he came out, he explained that our orders were actually about to be brought out already, but if we don't mind waiting a few more minutes, he'll have the parts swapped. Of course we were willing to wait, and I told him I don't mean to be difficult, but I really don't enjoy the breast part of the chicken (notice how I stressed "of the chicken"?). Unfortunately, minutes later, a different waiter brought out one of the chicken dishes and it turned out to be a breast part. Before I could say anything, Louie heroically swooped in and said, "Sir, I apologize, I'll have this changed immediately." Louie might as well have been wearing a mask and a cape, because the man just saved my lunch. I wasn't planning on ordering any appetizers, but I'm a sucker for a good fried wonton. So I decided to order the Fried Wontons with Special Sauce (P98 for 10pcs), hoping for something to the effect of North Park's "Pinsik Frito". Well, it didn't reach that level of awesomeness, but with the Black Soy Sauce that they provided, it wasn't actually too bad either. 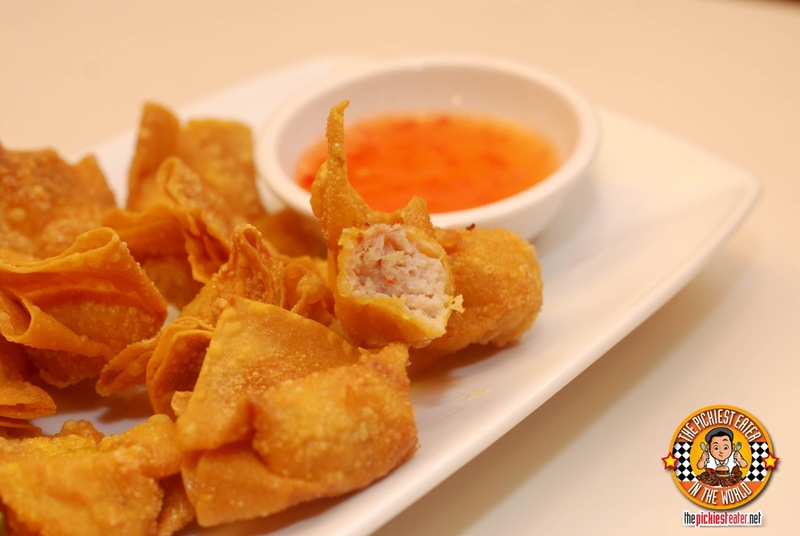 The Wonton was filled with ground chicken meat that lacked a little bit of a punch of flavor to it. The "Special Sauce" was nothing really more than Sweet Chili Sauce. Like I said, I preferred the Black Soy Sauce (Available upon request). Nothing out of this world, to be honest. When you order one of The Chicken Rice Shop's "Plated Meals", you are immediately entitled a bowl of soup and a rather large scoop of Chicken Rice. First off, I really like their Chicken Rice. It's better than that of Hainanese Delights, and can easily go head to head with Wee Nam Kee with no problem. It was stickier than your average Chicken Rice and the flavor of the chicken was evident. The thin soup, i'm assuming was some sort of chicken broth, had a smooth consistency and a light flavor. 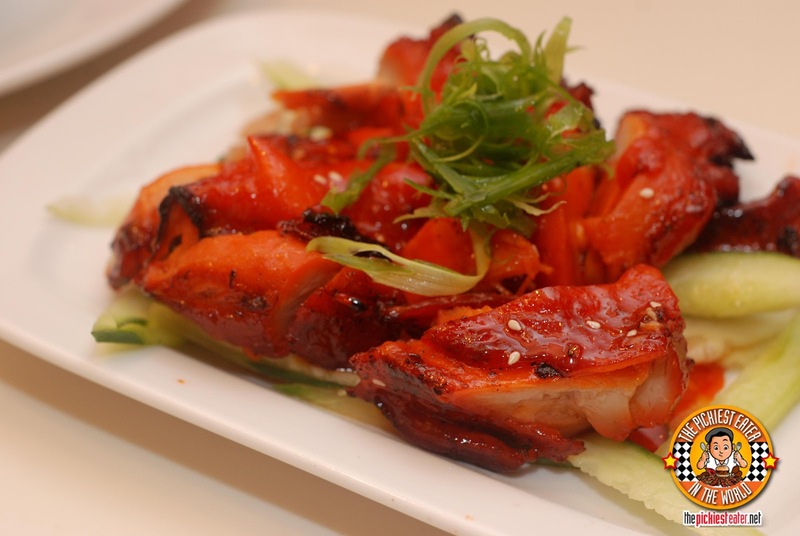 It was an adequate dish to get your palate ready for what was to come. 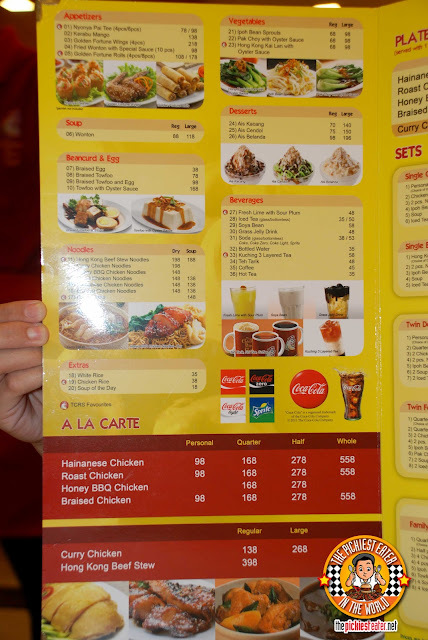 Whenever I'm at a restaurant, whenever I see something in the menu that's "Honey Barbequed", it instantly becomes a contender of items I plan to order. That being said, the Honey BBQ Chicken plate (P188 for 1/4 portion) of The Chicken Rice Shop was delicious! It had a nice glaze of honey barbeque sauce and was grilled beautifully, leaving the some edges blackened, because the sauce had caramelized into a sweet crunchy layer. There was also more than enough BBQ sauce drizzled on the plate in case you wanted to dip your chicken into some more sauce. 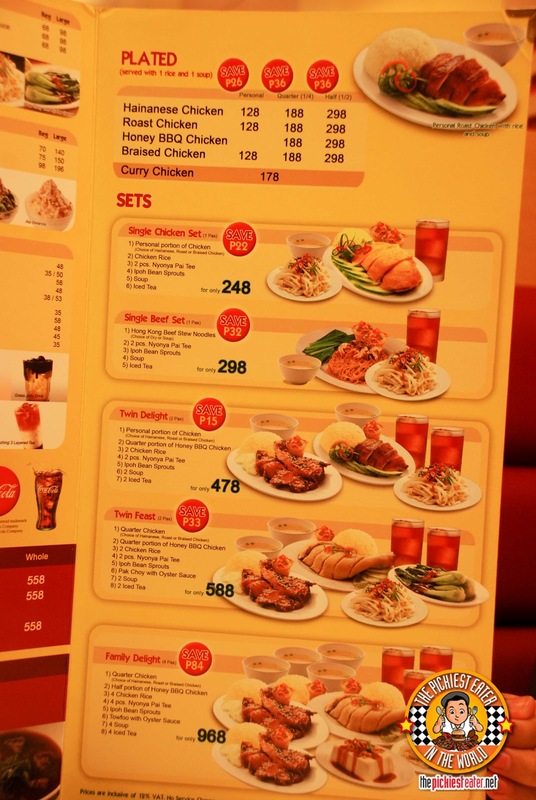 For Rina, I ordered the Hainanese Chicken (Personal P128). the chicken was amazingly moist and tender, and it was drowned in a light sweet soy sauce that helped bring out the flavor of what sometimes, if not done right, could be a bland chicken dish. 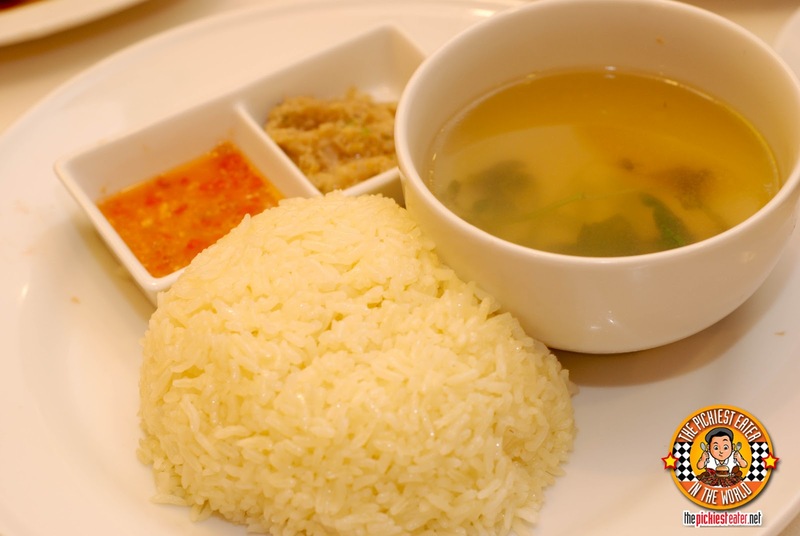 Truly a Perfect match with the Chicken rice and ginger sauce! Louie also suggested I try their Roast Chicken, so I ordered a Personal size one (P98). It was a bit smokier than the Hainanese, but they also poured the same sweet soy sauce, making it taste eerily similar. All in all though, It was still tender and juicy, with a nice layer of chicken skin.. Three things that I look for in a Roast Chicken. 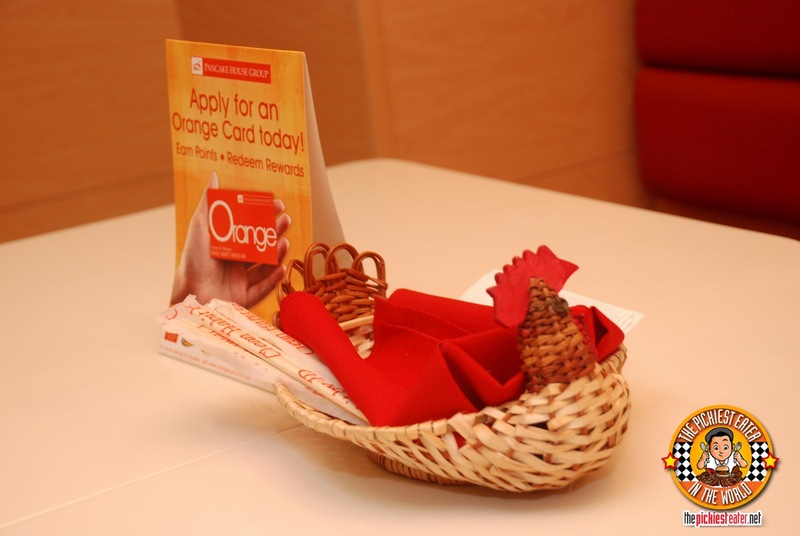 Even their Centerpiece was a Chicken! I enjoyed my trip to The Chicken Shop, particularly the Honey BBQ Chicken. 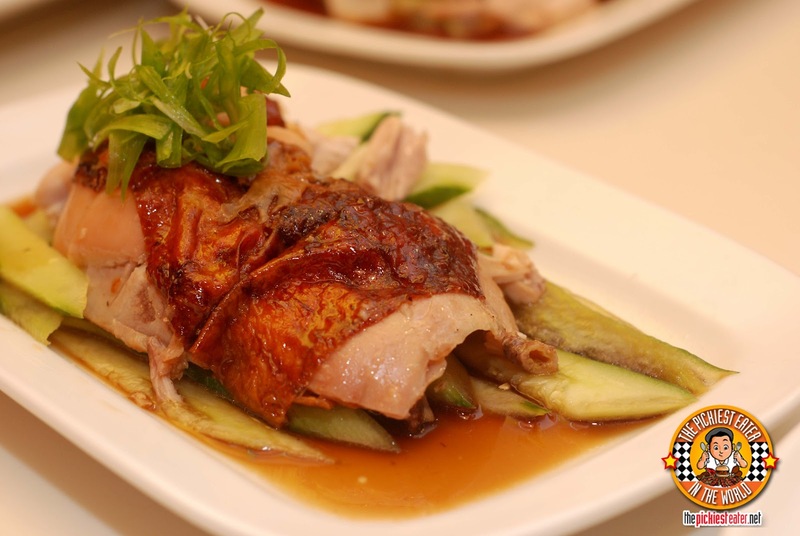 Though Rina liked the food as well, she mentioned that, apart from the size of the chicken, taste wise, she wouldn't really be able to taste the difference of the Hainanese Chicken of The Chicken Shop and the more affordable Hainanese Delights. The Chicken Shop has "Set Meals" for larger groups as well! Thanks for the recco, Anonymous! What's in it though? Tao Yuan.. haven't tried it yet.. but you got me interested! Thanks for the recco! darnit I should've asked for some bacon too while I was at it! Hehe thanks!! 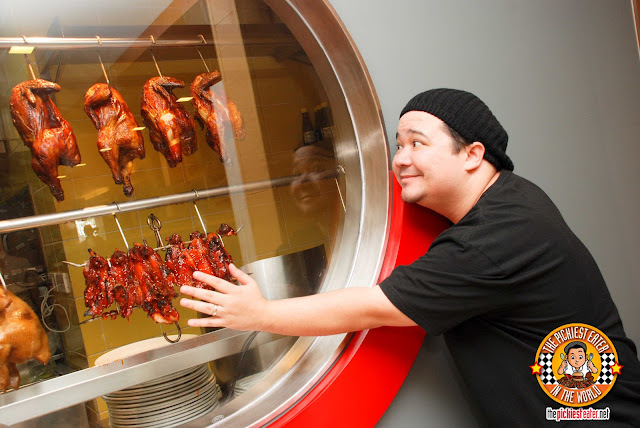 I like Wee Nam Kee's hainanese chicken :) but I also want to try this one! I think you're right.. your bf and I would get along fine because I also ordered the Honey BBQ (although I got the rice meal).. I didn't find it as bland as he did though. I'll give the desserts a try when I go back! I just stumbled upon this website while searching for places to go to when I visit Pinas next month. I'm so excited to see the new restos that have popped up! Thanks for sharing and so far I am enjoying this blog. 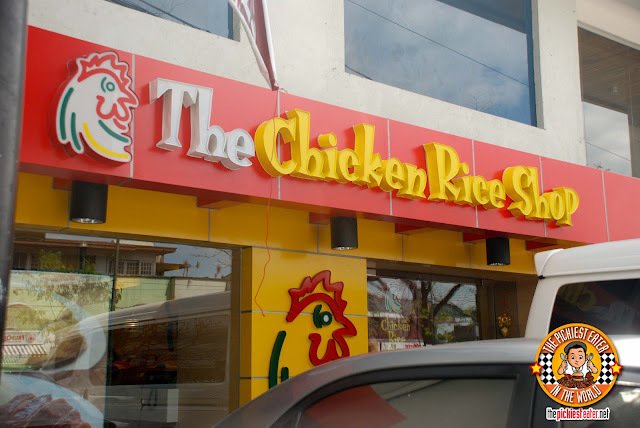 I was really thrilled to see Chicken Rice Shop here in the country. I got to try it in Kota Kinabalu and I really enjoyed the food, esp the Hainanese Chichen and Chicken Rice. If only I can have it for baon every day! :D Will try it this time in the PHL.